Opamps' Portable Audio and Video Press Distribution Feed Box Multbox Press Bridges can be used to feed away audio from multiple digital and analog video sources and analog audio sources and function as distribution units, with or without A/C Internal Rechargable Battery. All units are housed in rugged Zero Halliburton aluminum portable cases for demanding and reliable usage in the field and for transportation to other locations. 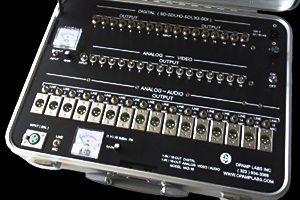 The Model VAD-16 1-in/16-out High Definition Video/Audio PressFeed Mult Box is useful as a hi-def network feed, for courtrooms, sporting events, concerts, etc. for up to 16 monitors, recorders, and amplifiers per section. The Model VA-8 Video/Audio Press Feed is a high quality transformer coupled versatile unit for conferences, meetings, courtrooms, auditoriums, sports events, etc. The Model VA-16/ML8 Video/Audio Press Feed is a high quality versatile unit for conferences, meetings, courtrooms, auditoriums, sports events, etc. The Model VA-32 is a 1-in/32-out Video/Audio Press Feed System. It is used in Network Feeds from Courtrooms, auditoriums, sports events and Public gatherings. The Model A-24/2ML Audio Press Feed is a high quality transformer coupled versatile unit for conferences, meetings, courtrooms, auditoriums, sports events, etc. The Model A-24P Passive Audio Press Feed is a high quality passive unit (no power required) for conferences, meetings, courtrooms, auditoriums, sports events, etc. The Model A-48 Audio Press Feed is a high quality transformer coupled versatile unit for conferences, meetings, courtrooms, auditoriums, sports events, etc.